This was the best money we spent on the wedding!! 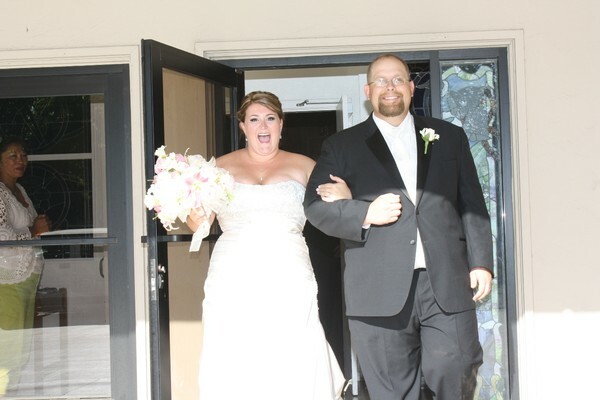 Steve made our wedding very special and memorable!!! 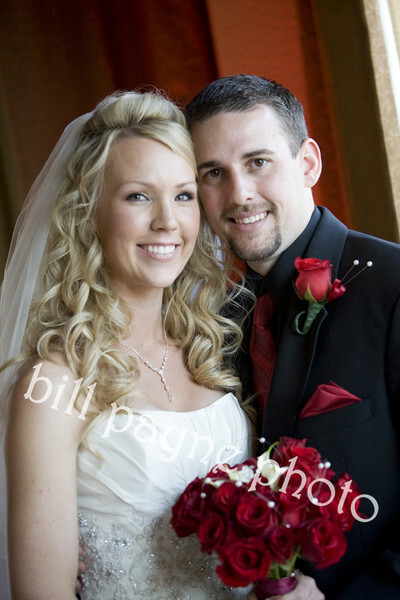 Thank you so much for making the wedding for Mr. and Mrs. Brian Jett such a magical night. Brian and Teresa are so happy and their wedding reception was fantastic. The DJ and photographer, the lighting, games, and coordinator helped to make this such a memorable time for all. Thanks again. DJ’s Placement – Does it matter? This is my first official blog on my site. I hope you find this information useful. Every week, I meet with couples and discuss their music, coordination of the event, lighting, theme and venue layout. The layout of the venue is important and one that many people overlook. Often, the layout is designed with a “look” or a “feel” attempting to create a magical, spectacular venue. From my experiences, the layout will definitely create a mood, but it can also create a flow… meaning how your guests interact with you and how they move about the venue, which also contributes to their fun. I suggest a simple layout as demonstrated by my illustration. With the dance floor near the middle, it will allow your guests to see all the action from the first dance to the bouquet and garter toss, the toast and the cake cutting. 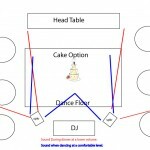 Once the cake is cut, the cake can be moved to the side for dancing. During dinner music(red area), it is played at a lower level, allowing for your guests to visit and chat. They won’t have to shout over the music. 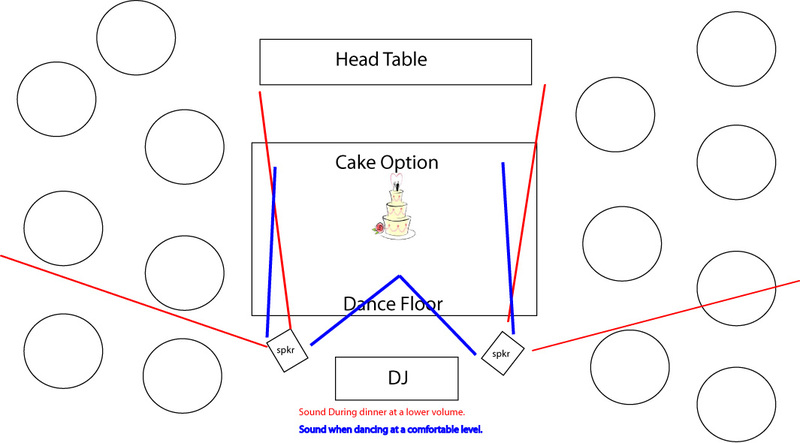 When the main dancing begins, the speakers are pointed towards the dance floor creating enough volume to fill the dance area while at the same time, directing the sound away from the guest’s tables. Your guests will be able to continue to visit, although, many will gravitate towards the dance floor (if you know what I mean). Finally, THE BAR! Where does it go? Whenever it’s placed in an adjoining room… that’s where people go. When it’s in the same room as the dancing (maybe towards the corner), people will linger around the bar, but still be part of the action. For example, At my 20th High School reunion, the committee members and I told the staff at the Peach Tree Golf and Country Club we wanted the bar in the same room as the dancing. Although their staff was reluctant, they obliged and it kept everyone in one room, therefore contributing to the event’s success. Too often, when the bar is in seperate room, people hang out at the bar and the dance floor could be busier. 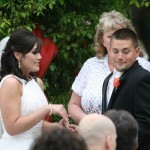 Trent & Cecilia Clark says Best DJ I have ever seen! Ruethai Steve Allard was our DJ for our wedding, and we were absolutely blown away! He had everyone in the room dancing. My husband and I couldn’t leave the dance floor the whole night we had so much fun. He made it the wedding of our dreams! 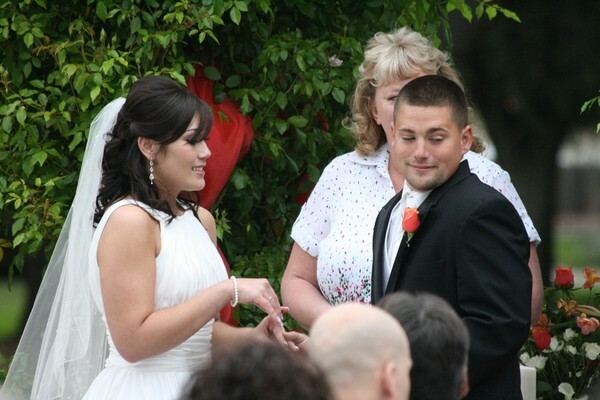 The most amazing part of it all, was looking around and hearing that it was our guests most memorable time as well. They don’t get any better than him. I will always recommend Ruethai Steve Allard for a DJ!! !